We, the undersigned student clubs, pledge to not participate in or apply to study abroad programs hosted at NYU Tel Aviv. Our participation would render us complicit in the state of Israel’s targeted discrimination against activists and Palestinian and Muslim students. In January 2018, Israel released a list of twenty organizations whose members are denied entry into the country because of their endorsement of the Palestinian call for BDS (Boycotting, Divesting from, and Sanctioning Israel). The University, as an adoptee of AAUP principles of academic freedom, has the duty to uphold these standards throughout the Global Network University (GNU) and be proactive in addressing any violations of these principles. NYU must upgrade its commitment to ensure equal access to GNU sites and to appeal decisions of entry within the Global Network. Until then, the members of our clubs will not study away and/or visit NYU Tel Aviv. 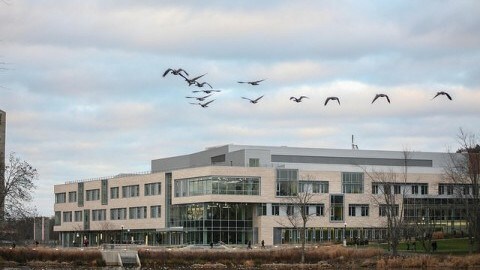 Recently, we have been seriously troubled by the case of University of Michigan Associate Professor John Cheney-Lippold, in which after refusing to write a recommendation for a student’s study in Israel application, has been arbitrarily punished through a freezing of his pay and a cancellation of all sabbaticals for the next two years. This sets a dangerous precedent, in which departments have the ability to unjustly penalize faculty simply for their support of Palestinian human rights. As a department, we stand within solidarity with Cheney-Lippold and any faculty and students that support the Israeli academic boycott for Palestinian human rights. We, the undersigned student clubs, pledge to not participate in or apply to study abroad programs hosted at NYU Tel Aviv. In response to your recent memo on the democratic decision of the graduate student union GSOC-UAW 2110 to endorse and join the Boycott, Divestment and Sanctions movement, we would like to highlight some errors and register our disappointment in the manner it was issued. 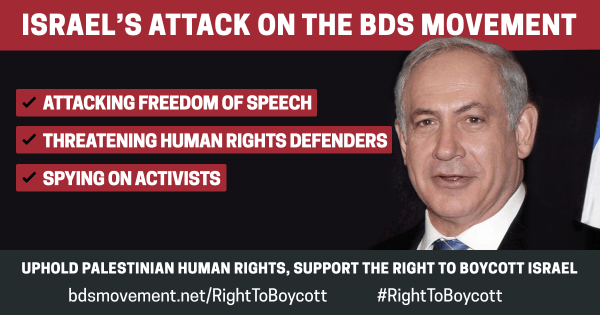 First, your memo misrepresents the boycott and the referendum Our vote for boycott never targets individual academics, but rather seeks to break ties with institutions that participate in the oppression of Palestinians and the curtailing of their human rights and academic freedoms. Under the academic boycott, no restrictions are placed on working with individual Israeli scholars–those following the boycott are still welcome to invite Israeli scholars to conferences, to co-author papers with them, and to coordinate research (so long as these scholars are not acting as official representatives of the Israeli state). What the boycott targets are institutional ties with Israeli universities and research institutes. For a full detailing of the academic boycott procedures, please refer to the guidelines provided by the Palestinian Campaign for the Academic and Cultural boycott of Israel (PACBI). Furthermore, while your statement claimed that our vote called on NYU to “divest from all Israel-related investments”, in truth it calls on NYU to divest from “Israeli state institutions and international companies complicit in the ongoing violation of Palestinian human and civil rights”. We are calling for divestment based on companies’ conduct and role in the oppression of Palestinians, not divestment from any company vaguely “related” to Israel. Second, we are disappointed that the memo does not acknowledge that this was a democratic referendum passed with strong support by 66% of voting GSOC members. Your dismissive attitude suggests that you have little regard for the actual concerns of NYU students, which have been given voice by GSOC’s vote. Moreover, the claim that the pledges of GSOC members could conflict with their responsibilities as employees of NYU is opaque, somewhat threatening, and certainly false. It is inappropriate for university officials to make vague, unsubstantiated gestures that suggest there might be negative consequences for individual graduate students who follow their conscience. Third, your failure to address blatant human rights violations is appalling and insulting to both the cause of Palestinian human rights and the democratic vote put forth by the GSOC. This is yet another regrettable instance in which the lives of Palestinians are unaccounted for and their voices are silenced. Contrary to the memo, opponents of BDS are not the only ones who claim that their position is in favor of academic freedom. We, along with all supporters of BDS, are deeply concerned with academic freedom, and indeed, the shocking lack of such freedom for Palestinian universities, students, and academics is one of the reasons we have called for boycott. As with the boycott of Apartheid South African universities–which NYU eventually supported, revealing that the university has not always been categorically against such boycotts–we hope to create pressure so that Israel respects the freedoms of the Palestinians, including their academic freedoms. We hope that out of respect for your graduate students and for justice, you issue a clarificatory statement acknowledging these errors. Sean Larson, a member of the graduate student workers union at New York University, describes his union’s historic vote in favor of Palestine solidarity. IT WAS 4:30 in the morning on April 22 before the final votes were counted in the presence of tearful and apprehensive onlookers and the result was announced: By a vote of 429 to 216, the graduate workers of New York University (NYU) voted overwhelmingly to join the boycott, divestment and sanctions campaign against Israeli apartheid. Nearly 650 union members voted on the referendum, a strong turnout indicating widespread support for justice in Palestine. 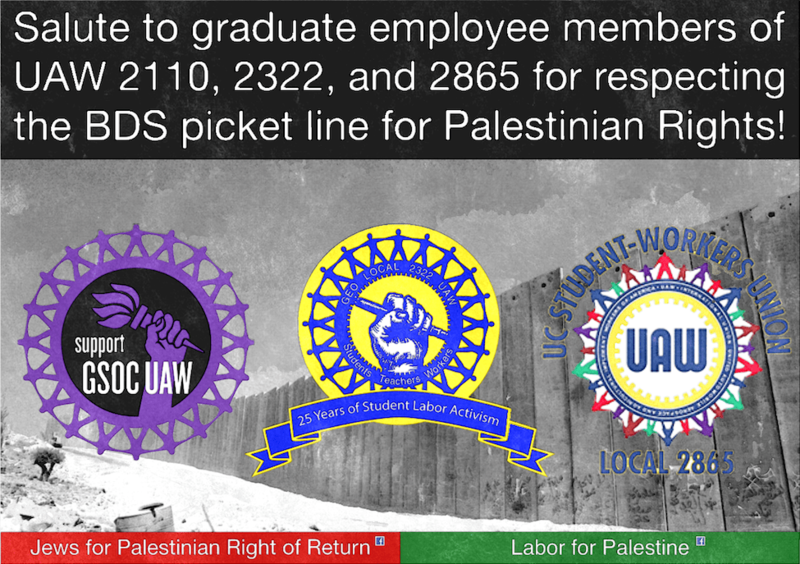 The resounding success of the BDS referendum was the culmination of a nine-month-long education and organizing campaign among the membership of the Graduate Student Organizing Committee (GSOC) at NYU, a part of United Auto Workers (UAW) Local 2110. 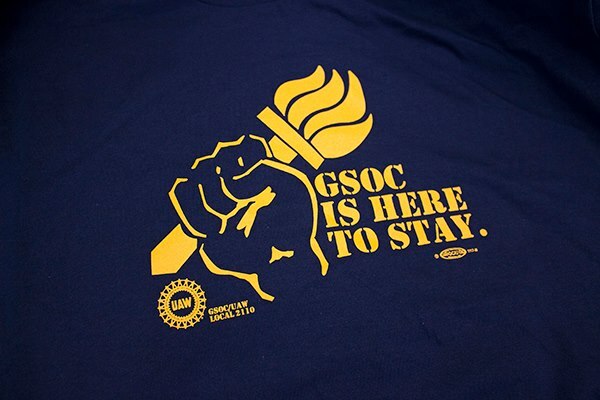 GSOC-UAW 2110 is a labor union representing over 2,000 teaching assistants, adjunct instructors, research assistants and other graduate workers at NYU, and the only recognized union in the U.S. for graduate workers at a private university. The BDS vote was initiated by GSOC’s BDS caucus in response to the call for solidarity from Palestinian civil society and all major Palestinian trade unions. With clear support from its membership, GSOC is now calling on both the UAW and NYU to withdraw investments from Israeli state institutions and international companies complicit in the ongoing violation of Palestinian human and civil rights. In accordance with the BDS call, GSOC is also calling on NYU to close down its study abroad program at Tel Aviv University, which continues to violate NYU’s own non-discrimination policy by enforcing Israel’s apartheid laws on its students. Additionally, 366 union members–58 percent of voters–also pledged to adhere to the academic boycott of Israel and refrain from participating in research and programs sponsored by Israeli universities. The academic boycott is an important step in exposing how all aspects of Israeli culture and scholarship are tainted with apartheid if they do not take a stand against it. One cannot be a fighter against one form of oppression while ignoring the systematic racism upon which one’s state is built and perpetuates itself. The recent stand by 22 Israeli anthropologists calling for the academic boycott of Israel is a bold example for others in the country and worldwide. The atmosphere of threats and intimidation that BDS supporters in Israel face is a reminder that Israel will tolerate many forms of progressive politics in the academy as long as academics keep their mouths shut about the occupation. IN THE U.S. support for the BDS movement continues to swell despite the crackdown on Palestine solidarity organizing. Predictably, this resilience is generating a panic among the defenders of apartheid, who are suddenly facing the prospect that they may go the way of the white South African regime in the 1980s or the racist backers of the Jim Crow laws in the U.S. South. It is the duty of every person of conscience to help in the effort to make this fear a reality and relegate systematic racism to the dustbin of history. In the meantime, let them tremble. BDS is proving to be hard to stop as a movement. Recently, the Graduate Employee Organization at University of Massachusetts Amherst passed a BDS resolution by referendum, followed by an academic boycott measure approved by the City University of New York Doctoral Students Council. These join many other U.S. academic associationsand several labor unions that have endorsed BDS. It is especially important for unions to take a stand in solidarity with Palestine. 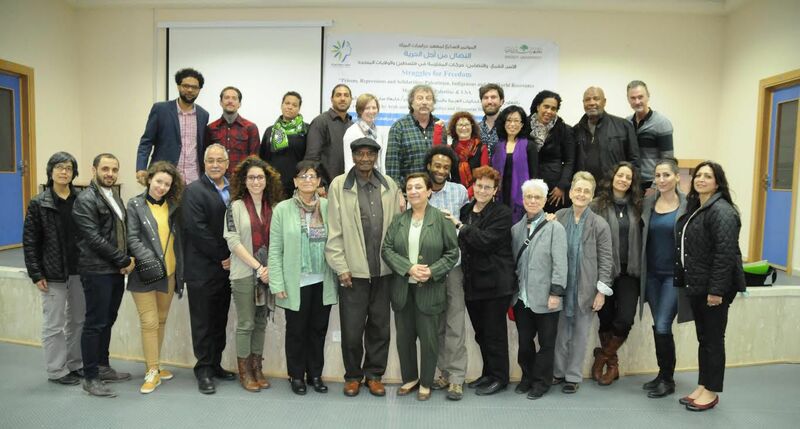 All of the Palestinian trade union federations have signed on to the BDS call, bidding their fellow workers worldwide to make good on the principle of solidarity as the basis for any effective labor movement. Opponents of BDS may criticize labor unions for taking a stance on a supposedly extraneous and controversial issue, but if the labor movement is to fight for a multiracial and international working class, it must combat racism and oppression of all kinds. 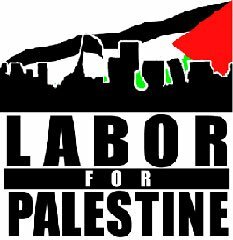 Palestine solidarity resolutions in labor unions are not “divisive.” That’s what apartheid is–by definition. BDS is a step toward unity, and this is all the more important for a relatively new union to show its members that it can represent their interests. At NYU, GSOC has demonstrated that it is a union willing to defend its many Palestinian members who are directly affected by Israeli apartheid laws. The endorsement of the BDS campaign shows that the union will foster a culture of acceptance and solidarity with the oppressed. Graduate workers will not stand idly by while Israel bombs the homes of fellow union members and the oppressed people of Palestine. 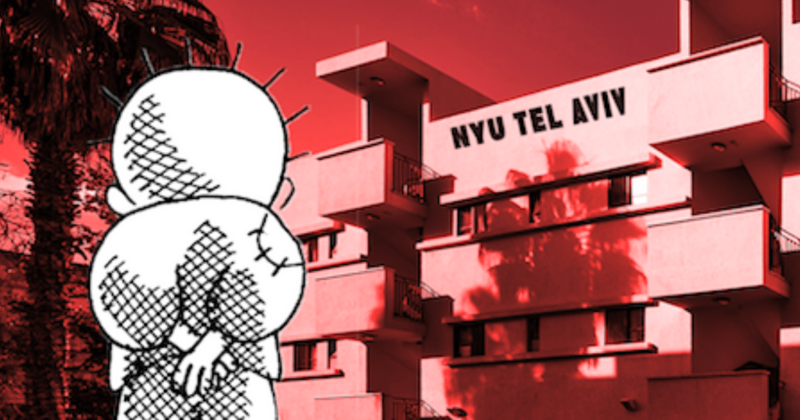 NYU’s institutional link with Tel Aviv University, which is located on the destroyed Palestinian village of Sheikh Muwanis and takes pride in developing military technologies and murderous war doctrines used in the occupation, will be henceforward put into question as a relationship that legitimizes apartheid. A SIMILAR BDS referendum passed by the 13,000-member strong UAW Local 2865 in California was later “nullified” by the UAW International Executive Board, a decision now under appeal by the Public Review Board. In the lead-up to the GSOC referendum, Local 2110 President Maida Rosenstein made the case for continuing to do nothing: “Why not wait until the Public Review Board rules [on the appeal by Local 2865] before conducting this referendum?” she suggested in a communication to GSOC stewards. Such hedging and legalism is to be expected as the solidarity struggle with Palestine heats up. Against this complacency we must remember that never before has change come about by itself. Segregation and the Jim Crow laws did not melt away while well-intentioned citizens let the legal system take its course, and the leaders of apartheid South Africa did not suddenly come to terms with their own moral bankruptcy. These systems of oppression were instead dismantled by broad-based social movements that took bold and uncompromising stands. For decades Palestinians have endured the brutal occupation of their land and waited for the international labor movement to recognize their suffering and take a stand. The attempted suppression of member voices in UAW Local 2865 only galvanized GSOC members in favor of BDS to redouble their efforts. Now the success at NYU has to be built upon in other labor unions and academic institutions. This victory in GSOC is an important ray of hope for the movement. In the early hours last Friday, as the votes came rolling in, each “yes” symbolized an outstretched hand of solidarity with the oppressed Palestinians. The dawning realization that victory in this vote was near brought waves of emotion among the many union members, including Palestinians, who were present. While I can’t speak for anyone but myself, I can say that if Palestinians saw the passion and dedication that I saw from the people of all different backgrounds behind this initiative, they’d be inspired with hope. Hope that they gave up on ages ago. Hope [the lack of which] has led us to where we are today–hope of an actual future. I know that for me, I had given up on things improving in my lifetime. But the results of last night resurrected that child-like hope again. Thank you GSOC. And thank you to everyone who participated, organized or voted yes. Here’s to a free and prospering Palestine. 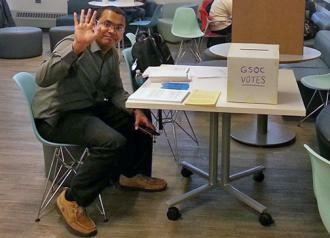 The NYU referendum shows that the tide is turning against defenders of apartheid. Palestine solidarity organizers should take courage from this historic victory and know that history is on our side. There will be justice in Palestine. The BDS movement is bringing it closer every day. 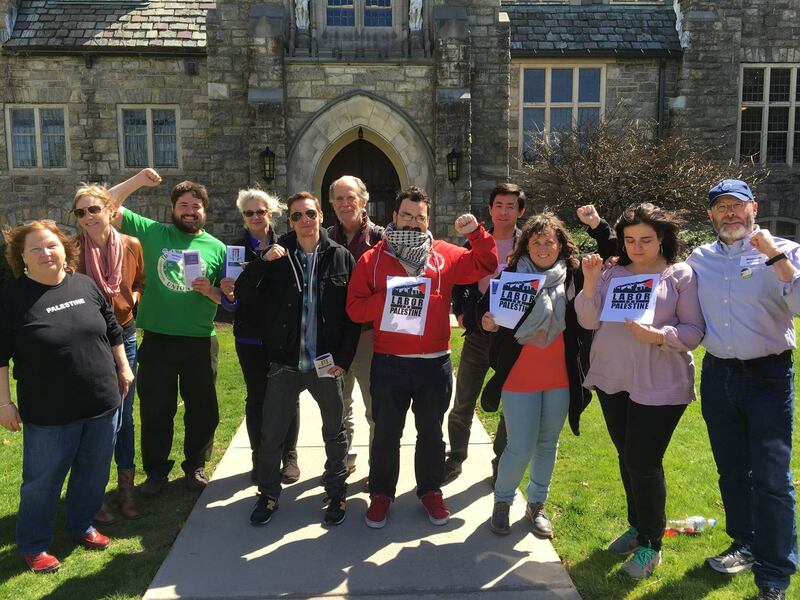 This past week the NYU Graduate Employee Union (GSOC-UAW 2110) and the University of Massachusetts, Amherst Graduate Employee Union (GEO-UAW 2322), both representing 2,000 members each, endorsed by full membership vote the call from all major Palestinian trade unions and civil society groups to impose Boycott, Divest, and Sanctions (BDS) against Israel. On April 22, GSOC-UAW 2110 endorsed a resolution calling for BDS against Israel with a 66.5 % member vote in favor. This endorsement came on the heels of the landslide vote of GEO-UAW 2322 member vote with 95% of voters in support. The resolutions calls on their respective employers–NYU and UMass–and their parent union, UAW International, to divest pension funds and other investments from Israeli institutions complicit in human rights violations of Palestinians. GSOC members also called on NYU to close its campus at Tel Aviv University, and 57% pledged to adhere to the academic boycott of Israel until they respect Palestinian rights. These resolutions by aspiring educators of future generations significantly contribute to the already evolving discourse on justice for Palestinians. Growing momentum in U.S. labor movements adds to over eight academic associations which have endorsed BDS with resounding majorities. Last year, the Connecticut AFL-CIO (200,000 members) and the United Electrical Workers (35,000 members) also endorsed BDS. As the movement for Palestinian freedom and equality continues to grow across the U.S., so too have concerted efforts to silence those critical of Israeli policies. In December 2014, the 14,000 student-worker union at the University of California (UAW Local 2865) system passed a similar resolution supporting BDS with 65% in favor. While admitting the vote was democratic, UAW International went on to “nullify” the results on dubious grounds, a decision that is currently under appeal. The decision clearly did not deter other locals from putting BDS to vote, a testament that movements for and by the people will persist despite undemocratic mechanisms of sanctioning political speech and grassroots commitments to local and global social justice. Numerous unions, labor groups, and human rights organizations supported the integrity of UAW 2865’s BDS stand. 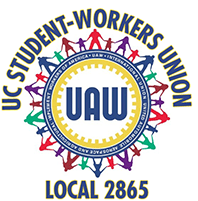 A statement by the Autoworker Caravan, a coalition of industrial workers within the UAW committed to social justice unionism, commended Local 2865 on continuing UAW’s tradition of anti-South African apartheid and civil rights activism. These resolutions reflect the will of rank and file members and have engaged wide segments of workers in vigorous debate and conversation. 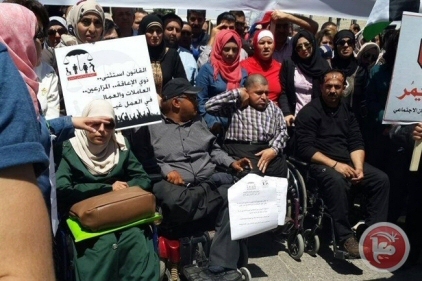 Members have learned that Palestinian labor unions are not recognized by Israel, creating especially dire conditions for the 92,000 Palestinian workers who cross into Israel and its settlements. Historically, the labor movement has exerted real pressure on employers through strikes and workplace actions, and BDS campaigns have played a major role in the democratic awakening among labor unions in the U.S. 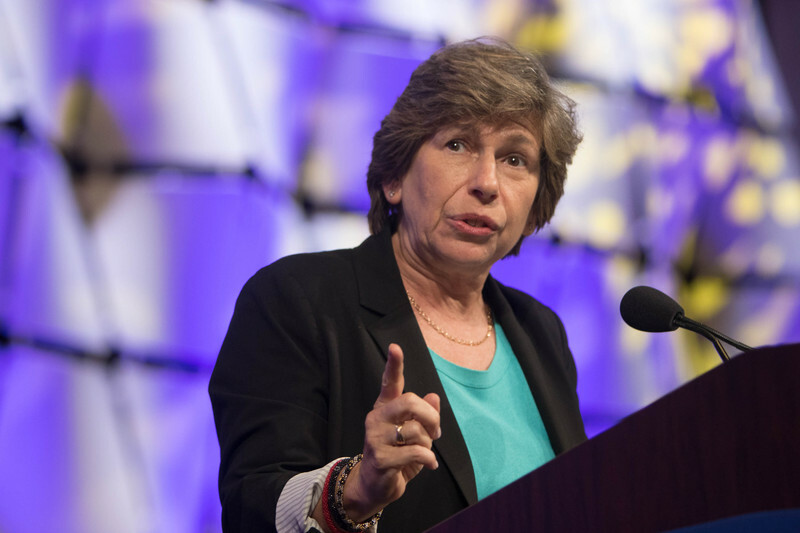 These new votes of U.S. labor union endorsements for Palestinian freedom and equality adds additional weight to the voices who have already spoken out against Israeli human rights violations, and in support of BDS. U.S labor unions have a rich history of standing in solidarity with struggles for justice, and members will continue to mobilize so that all workers matter, not just some.